If you’ve ever been a student, you might know the feeling of trying to break into an industry without any contacts or access to information. But chances are, you didn’t turn that feeling into a company with over 20 partnerships with large corporations, universities, and government agencies across the globe. It started in 2013 as a Facebook group that brought together a network of developers (affectionately referred to as “geeks”) to share information on the IT industry and networking events. Soon, they had turned their passion for building tech communities into a start-up, and today, Geekulcha has over 9,000 actively engaged users across the country, through which they’ve impacted the lives of thousands more. mLab Southern Africa supported Geekulcha at a very early stage, and continues to partner with their team. In 2013, infoDev profiled its founder, Mixo Ngoveni, as part of its Meet the Entrepreneurs series, and thought we’d follow up to hear about their progress in the years since. Check out our interview with Geekulcha’s Chief Operating Officer, Tiyani Nghonyama, and hear about some of the exciting programs they’re running today. How would you describe Geekulcha today? We create platforms that enable innovation and creativity. We bring excitement and enlightenment around technology, by building co-creation spaces, organizing hackathons or meet-ups, and facilitating tech trainings. We’ve now moved beyond Facebook; we’ve established the Geekulcha Student Societies which build ecosystems on campuses. We currently work with seven universities, and we’re actively working to expand to all 26 universities in South Africa. So, our business model really began and continues to be centered around developing partnerships with universities. In 2014 however, we realized that we also needed to reach out to high school students, especially those who might never go to a formal university. So, we established the Future Geekstars program, which monitors students’ progression from high school all the way to the job market. This led to the Geekulcha Vocational Work program (#gkVacWork) which we provide for free to high school learners. With gkMakers, we are also working to help grow the maker ecosystem, in terms of digital printing, optical technologies, and other innovations that mix art with digital tools. So, we’ve partnered with the British Council in South Africa and run a program [Maker Library] which has enabled us to reach a much broader network. I even got a chance to showcase some of our projects to Prince Harry when he visited in 2015. We also realized that we weren’t engaging enough with female students. So, the Raeketsetsa program organizes hands-on workshops and other events to get girls excited about tech, as well. Of course, we still host a lot of hackathons for developers, and corporate organizations often come to us to partner when they want to engage with a large community of students. Some of our clients include Microsoft, Intel, IBM, and others. Beyond high school and college students, does Geekulcha aim to reach other communities? One of the key things that we did was to partner with the Department of Economic Development and Tourism (DEDAT) in the Northern Cape, where the mLab will soon expand. We established the Northern Cape Developer Ecosystem which is an ecosystem of about 480 tech innovators and entrepreneurs. This is a very rural community, but within this province, we’ve been able to host five hackathons in the last 18 months. By building that momentum, and by giving the local developers more confidence, we’ve made sure that when the mLab South Africa expands to the Northern Cape, their tech entrepreneurs will already find some momentum in that province. At Geekulcha, we really believe in this model, and we’re planning to replicate these efforts across the country. In every province we visit, the reception is huge, and our corporate partners have been quite positive about this idea. How many partnerships do you have? We work with seven universities, three major cities, and 16 corporate partners, including banks, telecoms, insurance companies, and others. The partnerships with cities have been very helpful in terms of reaching out for resources. Developers gain access to city data and guidance on taking innovations forward. Some cities have also provided buses for our rural events. Regarding our corporate partners, almost every company realizes the value that Geekulcha can provide. Everyone from South African Breweries to large movie promotions to the Global Entrepreneurship Congress, where we ran social media activities and digital content reporting. One of my favorite programs that we’re relaunching this year is SkateHacks. 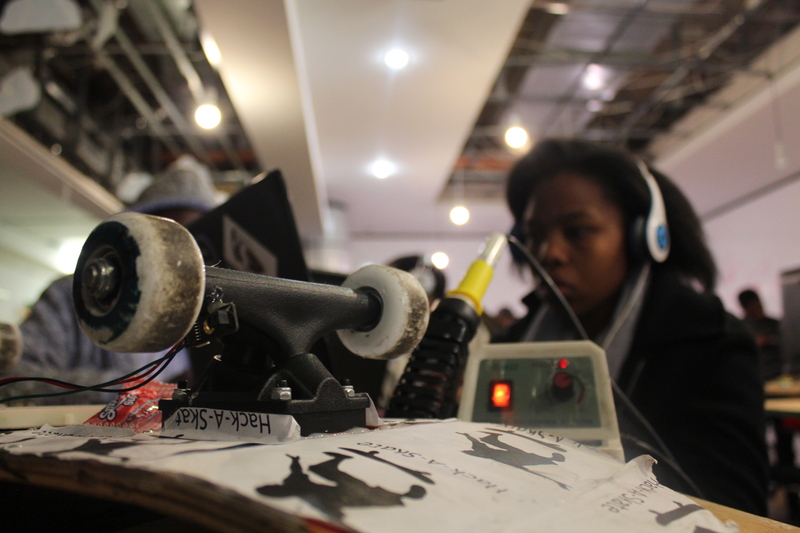 We go around to different skate parks in South Africa, with our partners from African Skate Project, and we let kids put technology into skateboards. Then, we build mobile apps so we can visualize data from the skateboard on a certain type of trick or its speed. So, it’s another of the many ecosystem programs that we run. With all of these partnerships and services you provide, how big is your team? The three main partners are Mixo Ngoveni, Sina Legong, and myself. In total, we’re only six full-time staff, but we also have a six-month internship program. So, we have 10 interns at the moment, and another group of 10 interns will start in July. In addition, each of our Geekulcha student societies has to be formally registered at their university and have at least six officers. These teams run all of the tech activities on their campus, and I’ve established what we call “Train the Trainer.” So, every year, all seven teams come to Pretoria for training; this year it was on cybersecurity. How do you define success? What’s your goal or vision for Geekulcha? Obviously, I want to see the Geekulcha platform expand even further, but success must involve providing greater capacity, providing for needs in the job market, and seeing a more vibrant tech ecosystem within South Africa — that is the ultimate success. The more the community grows for us, the more opportunities we have to generate revenue. Thus, enabling a vibrant ecosystem forms is key to our business model. So, success would be to grow the community across South Africa and further to other countries in the region. Has Geekulcha begun to expand regionally? Which countries have you targeted thus far? We currently have representatives in Mozambique, and also have key partners in Kenya. So, when we host our annual Geekulcha hackathon here for example, our partners have hosted it at the same time in Kenya both in 2015 and 2016. With Mozambique, we’ve been working on a skills exchange program, whereby their developers traveled down to see us and our team is heading there in September. Do you think Geekulcha is ready to scale up? Are you actively seeking investors? Right now, my two partners and I still fully own our company. We’ve actually refused a couple offers. We decided that we wanted to build our dream and develop Geekulcha as we envisioned. Through all of our services, Geekulcha currently generates SA Rand 600K - 800K a year (~$45-60,000 USD). However, our partners also cover several costs to host events and other programs. Geekulcha is one of the start-ups supported by infoDev’s Digital Entrepreneurship Program, sponsored by the Swedish International Development Cooperation Agency, Norway’s Ministry of Foreign Affairs, the Ministry for Foreign Affairs of Finland, and Denmark’s Ministry of Foreign Affairs (DANIDA).